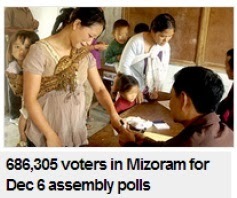 686,305 voters across 40 assembly constituencies in Mizoram 2013 (polling on November 25, 2013) 349,506 are women and 3,36,799 male voters. Women constitute almost 51% of the state’s voters. 51% of female voters but where representation goes, it’s zilch. 12707 women votes are more than male.